If you are a dog owner, your adorable dog is not just a pet; he is a valuable part of your family. Having a dog is like having a kid inside your home. Just like kids, they’re pretty hyperactive, like to play a lot, require attention, lots of love and deserves the best care. I bet your four-legged friend is making a mess inside the house like a kid too! Since dogs are really active, being dirty during playtime cannot be avoided. Bacteria and germs can easily stick to them if not cleaned properly. Ensuring your dog’s hygiene is a must, especially if you love cuddling your furry friend since the dirt can also be transferred to you. Never use detergents, or even your shampoo in cleaning your pets since there is a possibility that your furry friend will get irritation since human products are too harsh for them. This 2017, why not try the best dog shampoos in the market? We listed below the best dog shampoos you can buy for your pooch. This is one of the best dog shampoo for pooches with sensitive and dry skin. Oxford organic shampoo is claiming to be a quality product without compromise. Their product is 100% vegan and cruelty-free too! If you’re a fan of vegan products, you might want to consider buying this premium coat and skin treatment for your pet. Care for your pet’s fur while caring for mother earth? No worries! 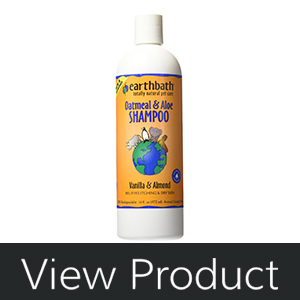 This shampoo is environment friendly for they are using natural ingredients without sacrificing its quality. The ingredients of this product is composed of delicate and balanced essential oils as the recommended coat care regiment by many veterinarians. Why not turn your pet’s bath time to play time? You don’t have to worry about your pet tearing up and getting uncomfortable with his shampoo since this product has a tear-free formula. It is the result of the natural oils mentioned earlier. It will prevent irritation or inflammation of your dog’s eyes or nose, making your bath session a playful one instead of struggling to avoid your dog’s eyes to be irritated. Aloe, jojoba and coconut oils will also help any itchiness on your dog’s skin. It also has moisturizing properties. Users of this product also praised the smell of the shampoo. This will last for a long time since it lathers up quickly so no need to put too much. This is available in a 20 oz bottle. Aloe Vera, coconut oils, and jojoba oils, Oatmeal, shea butter, and rosemary, Chamomilla Recuttita (Matricaria) Flower Extract, Sodium Laureth Sulfate (and) Glycol Distearate (and) Cocamide-MEA (and) Laureth-10, Collidial Oatmeal, Vitamine E, PEG-12. This product is also paraben-free. Note: Please be aware if your pet is allergic to any or the ingredients mentioned above. Composed of promising natural and organic ingredients. This makes the product mild enough for pets with sensitive and dry skin. The natural ingredients can also tame even the most brittle fur. This shampoo is tear-free since it doesn’t contain soap. Vegan-friendly, no paraben in the ingredients, and cruelty-free. The bottles are recycled so this is definitely eco-friendly. One bottle can goes a long way since it lathers up quickly. Can be used for any dog breeds. When it comes to price, this one is a bit pricey compared to other brands, but the product claims that you will get your money’s worth. Is your dog suffering from allergies or have sensitive skin and have fleas? This product can help you. Dogs who have allergies requires sensitive product so further irritation can be prevented. Premium Pets Oatmeal and Neem Oil Dog Shampoo and Conditioner is specifically formulated for dogs with allergies. It is tear-free for your dog’s sensitive eyes, alcohol-free so it won’t dry the skin, and soap-free for a gentler shampoo that won’t strip all the essential oils for a healthy coat. 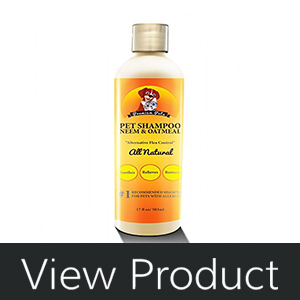 You can avoid longer bath times while using this product since the foam of the shampoo can be easily rinsed. Dogs have a natural odor especially if it has fluffy fur. This product will help you combat the odor of your pet and replace it with a pleasant subtle smell. Products that eliminate fleas are often has strong chemicals, but not this product. It can help you with your dog’s flea problem while avoiding harsh chemicals that can worsen your pet’s skin condition or can cause irritations. Most consumers of this product provided a good feedback about how it eliminates fleas and even acts as a mosquito repellant. It says on the direction to leave the shampoo for 3-5 minutes before rinsing to kill the fleas. Just like the other shampoos on the list, this has organic ingredients. The oatmeal is proven to improve skin conditions and help relieve skin itch while the neem oil is to repel mosquitos in the environment. You can even use this for your cat if you also have one, it will work wonders for her too. This is available on a 17 oz bottle. Deionized water, surfactant blend, (coconut shampoo base) pure neem oil, hydrolyzed oat proteins (relieves itching), Vitamins A, D and E, glycerin(soothes the skin), glyceryl sterate (emulsifies, makes foam, conditions), almond oil, blend of cherry and botanical extracts, EGDS (conditioner), EDTA (aids in ingredients blending), proprietary blend of coat and skin moisturizers, DMDH hydantion ( preservative). 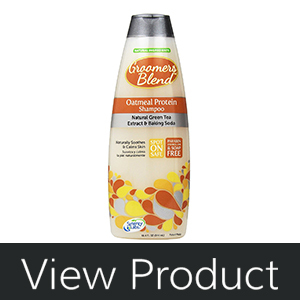 It’s especially formulated for sensitive skin or skin with allergies. There’s unique combination of two ingredients, oatmeal (to relieve itch) and neem oil (serves as mosquito repellant). It can eliminate and prevent fleas without the harsh effect of chemicals that can cause skin irritations. It will clean your pet’s coat without stripping the essential oils. The smell is not too strong and smells citrusy. The ingredients are not harmful for the environment. The shampoo is thicker than the usual dog shampoos, and it would be more convenient if the bottle have a pump. If you’re fur baby has a very strong odor and gets extremely dirty most of the time, try SynergyLabs Veterinary Formula Triple Strength Dirty Dog Shampoo. When it comes to deodorizing qualities, this one is top notch. It provides heavy duty cleaning for your pet. 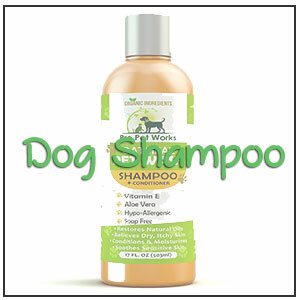 It is a concentrated shampoo that has an active cleaning ingredient stronger than most of the anti-bacterial shampoos for your pets in the market. Its formula has an ionic technology to make your pet stay clean longer and the smell of pleasing green apple and white tea to stay for a long time in your pet’s coat. Amazing, yes? The ingredients for this product looks good too; wheat protein (will make your pet’s fur shiny and prevents itchy feeling), shea oil, aloe vera that can soothe the skin, and vitamin E.
With these ingredients, combined with the 3 times stronger cleaning property, your pet’s coat will stay clean and odor-free without stripping out the moisture which can result to dry and itchy skin of your pet. This is available in a 17 oz bottle and a 1 gallon bottle. Deionized water, anionic, nonionic and amphoteric surfactants, glycerine, wheat protein, kukui nut oil, shea butter, vitamin E, aloe vera, fragrance, DMDM hydantoi, tetrasodium EDTA. It has 3 times more active cleansing ingredients compared to other brands. It effectively leans the dirtiest and smelliest pets. With exclusive Dirt Repel formula for your pets. It comes with a yummy scent; Green apple combined with white tea. It is enriched with wheat protein, Shea oil, Aloe Vera and vitamin E that leaving your pet’s skin moisturized without the sticky feeling. If your pet have a very sensitive skin, the triple cleansing ingredient might not be suitable with your pet’s skin type. You need to be extra careful with the packaging since some of the users posted about the leaking bottle when not handled carefully. 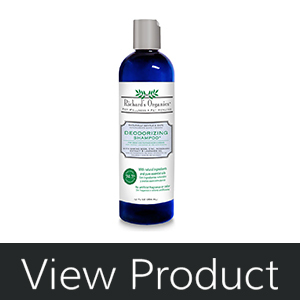 Richards Organics Deodorizing Shampoo is another promising product of SynergyLabs. 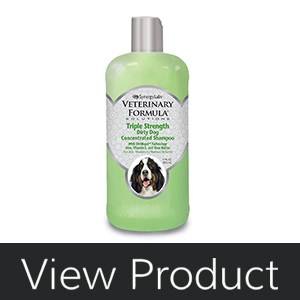 This one is also for dogs with strong odors, though this one is milder than Veterinary Formula Triple Strength Dirty Dog Shampoo and can be used even for dogs with very sensitive skin. This shampoo with remove and control the odor problem of your pet, and with its natural extracts and oils, it will soothe the skin and leave coat clean, shiny and healthy. This product is packed with baking soda, for cleansing the skin and removing bacteria and dirt and also knows as natural odor eliminator, zinc for improving healing of skin, produces anti-inflammatory effect and protects skin from UV radiation. The rosemary extract, lavender oil, and coconut oil as base are for moisturizing the skin which is essential. It is naturally gentle and can be used even for cats, kittens, or puppies. It comes in a 12 oz bottle. Eliminates the strongest odor even for pets with sensitive skin. It uses baking soda as a natural cleaning agent and odor eliminator. Rosemary and Lavender Oil are one of the delicate oils suited for sensitive type of skin. It also have zinc as of its unique ingredients for skin protection. It takes a while to bubble up and a will take a little longer to rinse of. Needs improvement with the packaging. This is recommended especially for dogs with itchy and dry skin. This shampoo contains Oatmeal and Aloe Vera that combat skin irritation, promote healing, and re-moisturize sensitive, dry skin. Another good thing is it’s all natural, soap free and pH-balanced to clean and deodorize safely and thoroughly, leaving your pet’s coat and skin brilliantly clean, soft, plush and smelling better than ever before. There’s also vanilla and almond oil in the ingredients of the product for your pet to smell as good as he feels and looks. Sound good right? Most of the users of this product say that their pets stop their obsessive scratching after they used this shampoo. This is safe for all animals over 6 weeks. The product has other variants to choose from: Mango Tango and Eucalyptus and Mint. It comes in 472 ml bottle. If you prefer a larger one, this is available in a 1 gallon and 2.5 gallon bottle. Purified water, colloidal oatmeal (3%), renewable plant-derived & coconut-based cleansers, aloe vera, vitamins A, B, D & E, glycerin, allantoin, food-grade extracts of vanilla & almond, natural preservative. This product contains no soap, gluten, DEA, parabens, synthetic dyes or perfumes, SLS/SLES, phthalates, or enzymes and is animal cruelty free. Sudsy runoff is safe and harmless to plants and animals. The product is all natural and eco-friendly, the packaging is also biodegradable. The smell is not too strong and it’s very pleasant. The smell will also last throughout the day. It lathers quite quickly, and can be washed off easily; no residue will be left on your fur baby’s coat. It’s very gentle and won’t leave you dog with irritation or a stinging feeling when the shampoo is applied. Guaranteed effective. This will leave your dog’s fur shiny and clean. Earthbath ensures that you can get your money back if not satisfied with the product. It comes with different scents and sizes depending on your preference and needs. Can be easily found in the market. Other variants of this product might contain tee-tree oil that is okay to use for dogs and can soothes their skin but it is harmful if you want to use this product for your pet cat. Some product users complained about the leaking packaging, though the shampoo works well for them too. If your pet is not older than six weeks, this product is not recommended. It’s only for pets over six-week old. If you want to restore the natural color of the fur of your pet and other cleansing bars or shampoo can’t do the job, give this product a shot. It claims to brighten white coats, removes stains and creates “show-ring” perfect coats without bleach or peroxide than can damage the fur of your pet and irritate the skin due to its harsh chemical properties. It has a Patented Optical Brighteners that safely eliminates the appearance of yellowing & dingy fur while bringing out pet’s natural show-ring bright white coat. It also has a Silk Restoration Complex feature that will lock-in moisture of the fur and gently untangled it for a softer coat. If your pet is under a skin treatment, you can still use this product and it won’t affect the treatment. The pH balance of this product is suitable for your pet. Human shampoos and conditioners are formulated at a lower pH (more acidic) – and should not be used on your pet. Purified water, coconut oil based cleansers, acrylates copolymer, glycol distraught, green tea extract, colloidal oatmeal, fragrance, DMDM-hydantoin, tetrasodium EDTA, FD&C Yellow #5. Can restore pearly-white fur of your dog without harmful bleach or peroxide. Can eliminate yellowish tint on your pet’s fur and bring out its bright white coat. It has properties that can lock-in moisture in your pet’s fur for it to look glowing. It is very gentle and has a mild scent. You need to squeeze out the product since it’s in a slim bottle. It takes some time for it to lather. 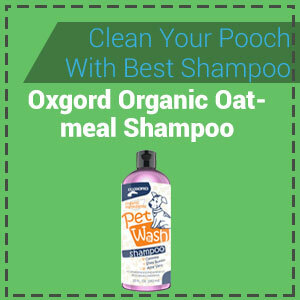 Products listed above are carefully researched to provide you with the best dog shampoos for your pooch. It is very important that you choose the best product and consider the needs of your pet so you can avoid irritations and other skin problems. Also, take note of the precautions of every product you use for your pet so that you’re fur baby’s safety and wellness won’t be compromised. Caring for them is a form of showing them that they are loved.